Austin — The Tenth Annual Texas Community Music Festival featured a program as diverse as Austin and provided music lovers of all ages with something old and something new. 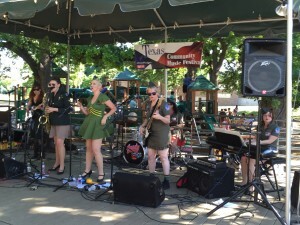 In all, FOURTEEN sets were performed either on the patio or the deck at Central Market Sunday. The day began with a program of traditional jazz and choral classics, performed by La Grosse Tete, the Dell Tones, the Dixieland Accidentals and The Austin Banjo Club. Redbud performed a set of original music in its first TCMF appearance, and the showcase stage featured the guitar of Peter Mazzetti, with vocals by Tolo Martin. As the afternoon sun bathed the Central Market patio in much welcomed sunshine, the TCMF program got considerably more “rock and roll,” with The Blue Diamonds, the first TCMF appearance by Ready Betty and solos by songwriter/singer Beth Lee. Bobby Davis and the Austin Jazz Band took the stage as the sun began to set, featuring vocals from longtime TCMF favorite, Lisa Clark, and the day’s fourteenth and final set was powered by the ever funky Boss Street Brass Band, who had the entire TCMF crowd singing and dancing along. Monday’s program kicks off at 5:30pm with the Westbank Jazz Ensemble, followed by Las Gabacha-chas and Bubba Coletrane and the Train Wrecks. Remember, EVERY TCMF performance is family-friendly. And every performance is FREE to the public!